Situated in the spectacular Harlech area in North West Wales, the championship course at Royal St David’s reflects the majestic character of the local land, and its quality is highlighted not only by the prestigious international amateur and professional events that have been hosted by the club, but also by the fact that this is actually the second highest ranked golf course in Wales, topped only by the amazing Royal Porthcawl in the South. 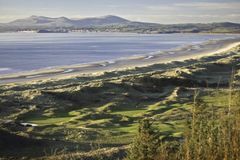 Lovers of links golf visiting North Wales simply can’t afford to miss out on a game at Royal St David’s, which sits under the watch of Harlech Castle, with only a giant series of sand dunes separating the course from the sweeping bay of Tremadog. With the imposing Harlech Castle overlooking the course and enormous sand dunes separating the course from the Irish Sea, not to mention the spectacular views across to Snowdon and the lesser peaks of Snowdonia, Royal St David’s enjoys an enviable location that will surely enthral any visiting golfer. The course measures a little over 6,600 yards from the championship markers but don’t let that fool you; this is without doubt a stern test of links golf. Locals would certainly agree; viewing St David’s as the world’s toughest par 69 golf course! Unlike many traditional links courses, Royal St David’s doesn’t follow the “9 out and 9 back” routing but rather holes face every which way, meaning the golfer must be constantly aware of the wind direction and how it might affect play. Over the 1st dozen holes especially, the wind plays a huge part in determining the challenge of the course, as these holes traverse a relatively flat patch of links land. It’s not until the 13th that Royal St David’s makes its way into the dune land, and it’s here where the course becomes truly memorable. After climbing to the 16th tee where you can catch a glimpse of the Irish Sea, the course head inland and back towards the clubhouse, and rather unusually, finishes on a tough, 200 yard par 3. Like all classic links courses, Royal St David’s main protection, apart from the weather rolling in off the Irish Sea of course, comes in the form of devilish pot bunkers, punishing rough and a great variety of uneven lies which force the golfer to use their creativity and shot making. The remote coastline sets a remarkable scene for Royal St. David's, which is surely one of the most incredible golf tour experiences anywhere in the United Kingdom. The par 4 15th at Royal St David’s is not only the course’s signature hole, but one of the toughest the player will face as well. From the slightly elevated tee, the entire hole is laid out right in front of your eyes and while this is one of a couple of holes on the course without a single bunker, it is fair to say that it doesn’t need them, such is the challenge it presents in its current form. After a testing drive which must be well struck to carry the rough and dunes, the second shot is played over a break in the fairway which can throw off your depth perception subject to where you’ll be playing your approach from. Unless you’re a particularly long hitter, a long iron or even a fairway wood will most likely be required to reach the green, which is protected on the right by a huge, rough-covered mound. This testing hole is right in the heart of the course and with spectacular views in almost every direction; it’s one of many memorable holes at Royal St David’s. Click the “Show Videos” tab above to see the hole in more detail. There is ample opportunity to warm up before your round at Royal St David’s, with a full length driving range with real grass teeing areas, as well as ample short game practice areas. The clubhouse at Royal St David’s has been tastefully furnished to reflect its original Edwardian character, and is a golf historian’s dream, with a great wealth of history and tradition on display throughout. Modern conveniences ensure it serves as an excellent base for golfers to relax before or after their rounds. Don’t be put off by the “Royal” moniker as St David’s offers a warm welcome top visiting golfers, with members who are extremely proud of their course being friendly and accommodating at every opportunity. The clubhouse bar has a large screen television which is perfect for catching up on sporting events while enjoying a delicious meal and with panoramic views of the 18th green and the dunes that separate the course from the shores of Cadigan Bay also on offer, the option of simply relaxing over a well deserved drink is always there too. Hire clubs are available, with the latest Titleist and Taylor Made clubs on offer for both men and ladies. Left and right handed options both available. Golf buggies, as well as both pull and electric trolleys are also available for hire. PGA and European Tour player Freddie Jacobson won the British Youths Open Amateur Championship at Royal St David’s in 1994.